Definitely, project depends on a number of parameters, and we ask more that 30 questions related to project in Model Input Form. Please fill it out and click on Send button. Form will be submitted to our calculation server and in 10-30 seconds a .pdf file will be shown on this page (or downloaded by your browser). Results of calculations for free are “noised” with some arbitrary coefficients. 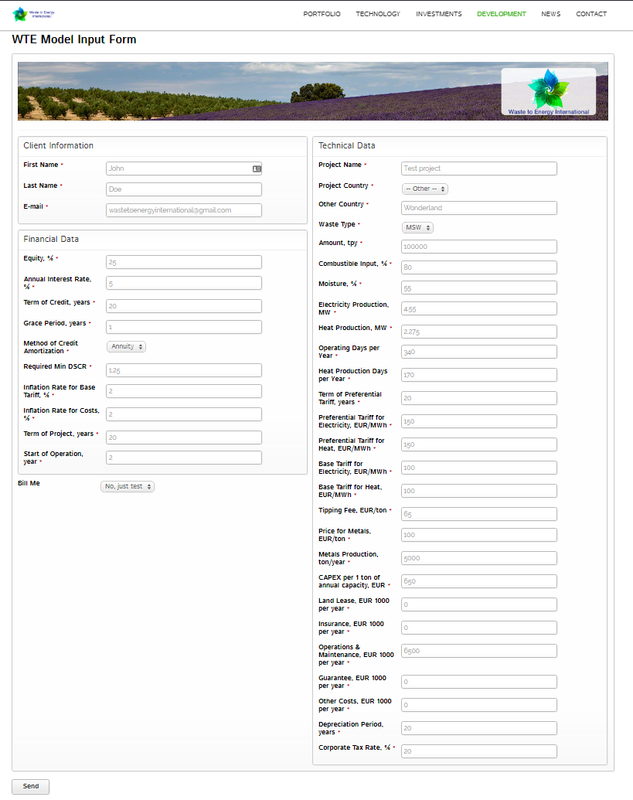 If you send several times a form with the same values, you will have a number of different results in .pdf files returned. To get exact calculations, please select “Yes, I need exact results” in “Bill me” field. Shortly you will receive a bill on EUR 599. Upon receipt of the payment, we will send you by email another .pdf file with exact results. Even test mode, with “noised” coefficients, you can have a general “feeling” of the project and prevent yourself from rough mistakes in estimation of the economic efficiency. Try online financial model in test mode for free and get first estimation of your waste-to-energy project! This model supports online calculations for MSW (municipal solid waste) only so far. You can order calculations for almost any type of waste, technology (incineration or pyrolysis), for production of electricity or synthetic fuel. Please fill out the form Project Questionnaire: Waste-to-Energy. We also have services for wind and solar power projects financial calculations, as well as full-featured “what if” calculation scenarios. Please refer to our Financial Model page. We can consider also some non-standard approaches like combined credit from 2-3 banks taken on different conditions and interest rates. Or, sculpture debt repayment profile can be implemented. Some times it is needed to attract working capital. All of these custom cases is subject of additional negotiations and time. The first step is most important, so protect your time and efforts and know for sure what is the real efficiency of your project.